As the weather outside gets nicer and spring flowers bloom, it’s more important than ever for those with mobility issues to get out and enjoy the fresh air. Many who find themselves already limited by mobility have spent even more time indoors than usual over the long winter. If you deal with mobility challenges, a mobility scooters can keep you more active and independent, and of course, help you take advantage of the fresh air and sunshine. Mobility scooters come in a variety of designs, from light and compact to heavy-duty scooters that can handle a wide range of terrain. Some feature one-hand disassembly for easy portability, whereas others can travel 18 miles or more at a time for a full day of activity. Baskets and storage space make shopping and running errands convenient. Taking rides in parks and your neighborhood. Going to the library and post office. Shopping at malls and stores. Attending places of worship, get-togethers at restaurants, local meetings, and other social events. Visiting friends, neighbors, and relatives. The benefits of using a mobility scooter extend beyond greater independence and a reduced dependence on caregivers to physical health, as well. Using a scooter reduces your likelihood of falls and injuries while it transports you safely on outdoor excursions and small errands, as well as lowers your risk for muscle strain and overexertion. Take steps today to maximize your independence and quality of life by choosing a mobility scooter as your mode of transportation. Scooters are rechargeable battery-powered and used on sidewalks. If you like to walk, you can park your scooter while you’re out, and come back to it when you need it. A portable scooter can be easily transported in a vehicle, so that you can take it with you on longer trips or when you are going somewhere in a family member or friend’s vehicle. A mobility scooter can enhance your functional mobility, leading to increased independence and a higher quality of life. 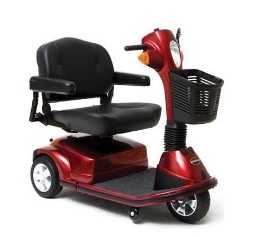 See Westside Medical Supply’s large selection of mobility scooters on our website, or call (585) 227-8750 with questions. Your insurance may cover your scooter. We will be happy to work with you to find the best scooter that meets your particular needs.